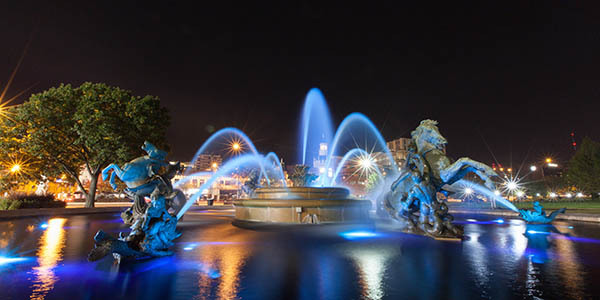 Known as the City Of Fountains, Kansas City overflows with exciting entertainment and activities. Catch a summer ballgame with at Kauffman Stadium to watch the world champion Royals, or hop in the driver’s seat for a NASCAR thrill at the Richard Petty Driving Experience. No matter your interest, Kansas City aims to please. Kansas City Plaza blue fountains. Step back in time at the Log Courthouse, an 1827 structure that served as Jackson County’s first government building. For a while, it was the only courthouse west of St. Charles, Missouri. See pioneer life come alive at Shoal Creek Living History Museum, home to authentic, relocated log cabins and other buildings that date from the early- to late-19th century. Walk in the footsteps of a local activist and advocate for social equality at the Bruce R. Watkins Cultural Heritage Center. Here, exhibits and stage performances illustrate the contributions made to the city by its African American community. Enjoy a slice of nature in the middle of a thriving metropolis at Lakeside Nature Center. The center offers wildlife education programs and is home to a hiking trail and native wildlife exhibit. It also houses one of Missouri’s largest wildlife rehabilitation facilities. Wander through stalls of fresh produce and artisan creations at the farmers’ market in historic River Market, easily the largest of its kind in the region. 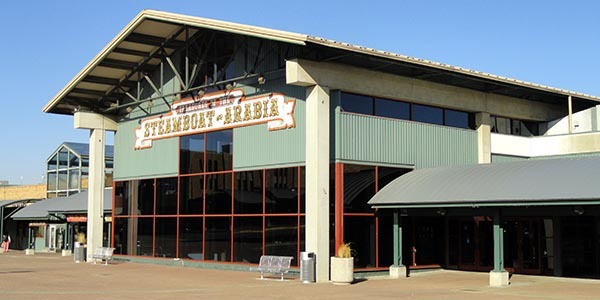 The site is also home to the Arabia Steamboat Museum and the largest collection of pre-Civil War artifacts in the world. Want to see where the buck really stops? Visit the Kansas City Money Museum and learn about the nation’s economy and Federal Reserve, and view the coin collection of Native Missourian and U.S. President Harry S. Truman. You can even get your hands on a gold bar that weighs over 20 pounds—you just can’t take it with you. Revisit the region’s role in expanding the frontiers of America on a tour of the Frontier Army Museum. This collection of artifacts is a tribute to the troops who were tasked with exploring unsettled territories from 1804 to 1916, as well as the work and impact of Fort Leavenworth in neighboring Kansas. On display are a 1790 prairie schooner and an aircraft like the one used in World War I.